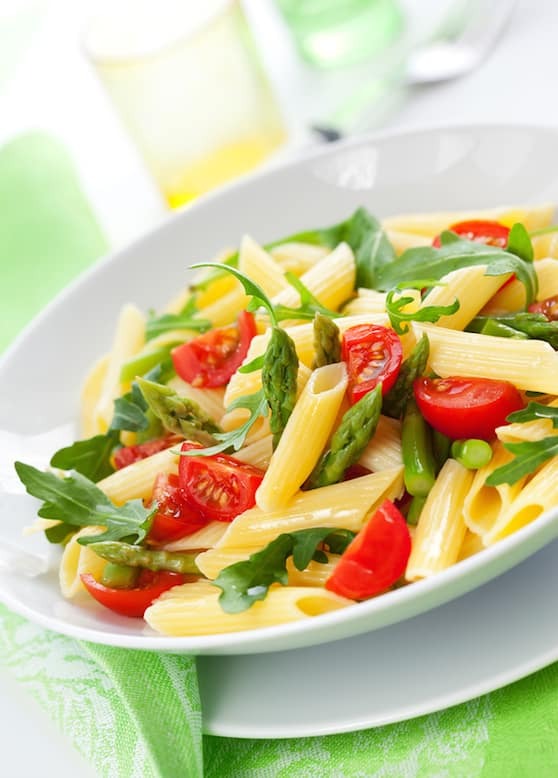 Mellow asparagus and bold arugula contrast nicely in this simple yet delicious pasta dish. It’s perfect springtime fare, though you can enjoy it year round. Complete the meal simply with a big salad (add chickpeas or beans for protein) and a fresh whole grain bread. Cook the pasta according in plenty of rapidly simmering water until al dente, then drain. Meanwhile, trim the woody ends from the asparagus spears and scrape any tough skin with a vegetable peeler. Fresh slender spring asparagus usually needs no scraping. Cut the spears into 1 to 2-inch long pieces and set aside. Heat the oil in a small skillet and add the garlic. Saute over low heat for a minute or two or until golden. Add the asparagus and a small amount of water. Cover and steam until the asparagus is done to your liking but still bright green. 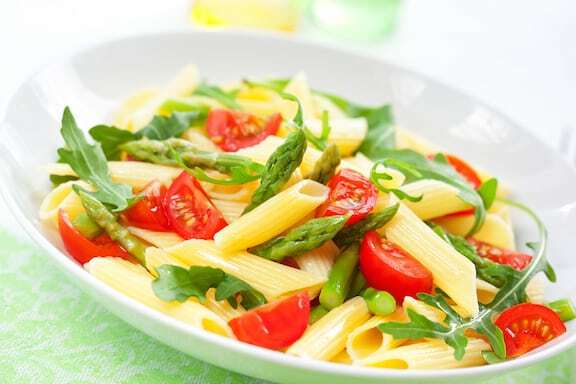 Combine the pasta, asparagus, arugula, tomatoes, and optional dried tomatoes in a serving bowl and toss together. Season with salt and pepper and serve at once. Here are more asparagus recipes. Here are lots more lighter seasonal vegan pasta recipes.